35th Avenue SE at Penny Creek closed in 2015. Photo credit: Richard Van Winkle. The City of Mill Creek announced that the 35th Avenue SE road closure has been rescheduled to begin at 5:00 am on Monday, July 2nd. “We had an opportunity to give the community one more weekend to use the roadway and we made the decision to keep it open as long as we could,” said Acting City Manager Greg Elwin. According to a City of Mill Creek news release, a full road closure of 35th Avenue SE will begin on Friday, June 29th, "in the early hours." The expected duration of road's closure has increased as the news release disclosed the road will reopen in December instead of October of this year. The news release stated, "The City strongly discourages the use of side roads off 35th Avenue SE for unofficial detour routes, as these are residential neighborhoods not built for arterial traffic. The side roads should only be used by local access vehicles." “Local access is intended for those people who live in one of the neighborhoods adjacent to 35th Avenue SE, including Highland Trails, North Pointe, Silver Crest, and Silver Glen,” said Gina Hortillosa, director of Public Works and Development Services. Original June 15, 2018, article. 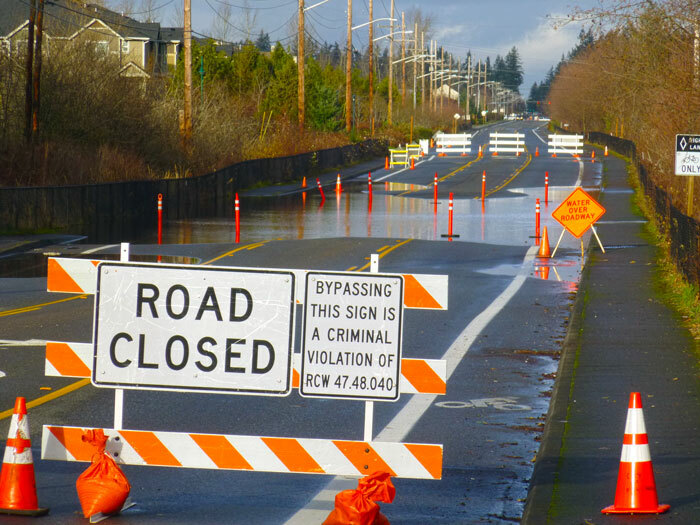 The City of Mill Creek authorized Harbor Pacific Contractors to begin reconstructing 35th Avenue SE to alleviate flooding where it crosses Penny Creek. Motorists should expect 35th Avenue SE to be fully closed from the week of June 25, 2018, until October 2018. Traffic will be detoured to 132nd Street SE (SR 96) and Bothell-Everett Highway (SR 527) during the full road closure. Snohomish County’s Seattle Hill Road widening project was originally scheduled to be complete by the time Mill Creek’s 35th Avenue SE project began. However, the current completion date is now August 1st according to Mill Creek Public Works and Community Development Director Gina Hortillosa. Why are there no plans to widen the roadway to two lanes in each direction? The roadway will not be expanded due to the associated environmental impacts to the surrounding wetlands and stream crossing. The peat bog surrounding 35th Avenue SE is a unique environmental asset, and is part of a large wetland and stream complex that provides wildlife habitat and flood mitigation. Thomas Lake is immediately to the east, and Penny Creek is a fish bearing stream that crosses underneath the roadway. Mosses in the peat can absorb and “lock up”excess carbon dioxide in the atmosphere, which can help mitigate global climate change since the acidic conditions in the bog results in slow organic decay. Why is this project occurring in 2018 when other projects are happening? The project timing is driven by two things: funding and functionality. The City is receiving a significant amount of funding from the state for this project. Some funds became available in 2017-2019, and all the funds must be used by 2019. Even though most of the work is occurring in 2018, it is possible some work might need to take place in 2019. By delaying a year, it could jeopardize the funds for project work running into 2020. Even if the City had waited until 2019, construction would still be occurring on the County’s 35th Avenue project and on the Swift Green Line project. In addition, by waiting, the City’s project costs would likely increase. The functionality of the road also is an impetus for completing the project. Each year, the City currently is closing the road or diverting traffic into the center turn lane for extended periods of time due to water over the roadway. As part of the City’s commitment to preserving its infrastructure, timeliness is of the essence when scheduling this project. Will this really fix the road? Will there be more flooding in the future? The reconstructed roadway will be raised above the existing elevation. While flooding will no longer occur, since the roadway is a non-permeable surface, water may puddle during rain. However, following reconstruction, the roadway should not be closed due to impacts from water. What kind of noise is expected? The driving of 500 pin piles will be a noisy undertaking and is expected to last for 60 construction days. Pin piles are 6-inch-diameter “pipes”that are on average 60 feet long. They are pounded through the deep peat material into load-bearing soil. If you are at home during the daytime, plan ahead and take noise reduction precautions. Listen to the sound of the pin piles to understand sound impacts on this YouTube video (sound starts about 2 minutes into this video). Will the road be closed to traffic? Yes, the road will be fully closed to traffic; no traffic will be able to get by on 35th Avenue SE between 139th Street SE and 144th Street SE. What is Mill Creek doing to mitigate traffic impacts in local neighborhoods? To help slow traffic down in the neighborhoods, temporary speed bumps will be installed. Digital speed feedback signs will be posted, and police will have presence throughout the neighborhoods and at stop signs to ensure drivers are behaving appropriately. In addition, the City is exploring the opportunity to partner with Waze to “block off”side roads in Mill Creek to deter people from being routed to them with the closure of 35th Avenue SE. Why wasn’t there coordination about entities to ensure construction project timelines didn’t overlap? The City coordinated with several other entities, including Washington Department of Transportation, Snohomish County, Community Transit, Puget Sound Energy, Snohomish County PUD, and the City of Everett. Because each entity has its own Capital Improvement Plan, projects will inevitably overlap at times. The City’s coordination effort with these other entities ensured that full road closures will not overlap and that one project’s detour route is not compromised by another project. What are the implications of state funding for this project? The state’s prioritization of funding for the 35th Avenue SE reconstruction project is a positive thing. In fact, state and federal funding is pouring into Snohomish County for many entities due to the tremendous growth in the area. This investment in growth management is positive for the area.